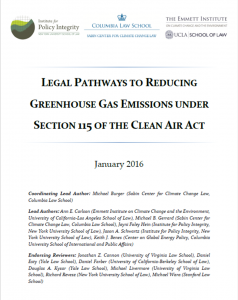 A team of law professors and attorneys at three of the country’s leading centers devoted to climate change and environmental law have published a joint paper concluding that an unused provision of the Clean Air Act authorizes the U.S. Environmental Protection Agency to develop and implement an economy-wide, market-based program to reduce domestic greenhouse gas emissions and achieve the Obama Administration’s Paris Agreement pledge. The program could be implemented without further Congressional action and would provide regulators and businesses seeking to mitigate climate change with clear benefits – increased flexibility, heightened administrative and economic efficiency, and greater effectiveness. 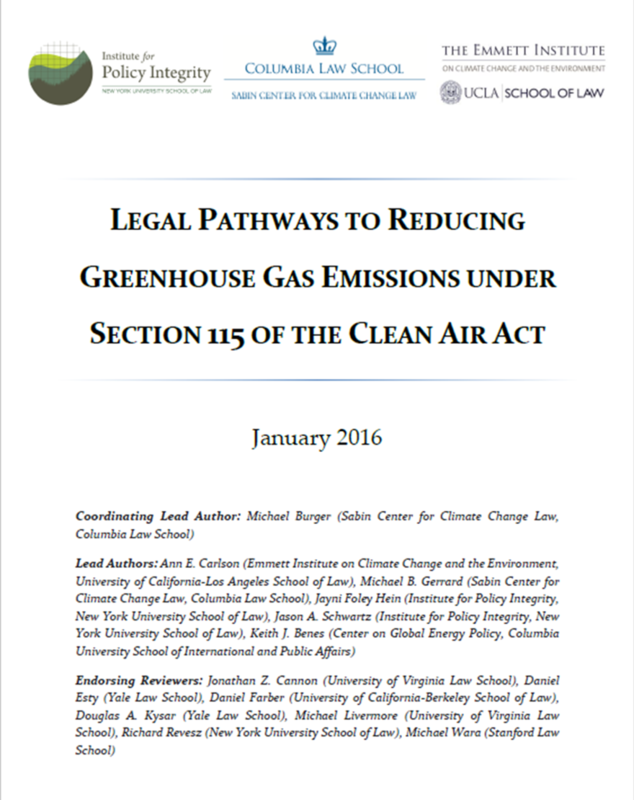 Legal Pathways to Reducing Greenhouse Gas Emissions Under Section 115 of the Clean Air Act was published by the Sabin Center for Climate Change Law at Columbia Law School, the Emmett Institute on Climate Change and the Environment at UCLA School of Law, and the Institute for Policy Integrity at NYU School of Law. The report offers an in-depth analysis of Section 115, titled “International Air Pollution,” which authorizes the EPA to require states to address emissions that contribute to air pollution endangering the public health or welfare in other countries if the other countries provide the U.S. with reciprocal protections. The paper examines the legal basis for invoking the provision, and a number of critical legal issues that would confront implementation of a comprehensive nationwide program. The thorough legal analysis and considered conclusions offer a blueprint for federal action, and have been endorsed by prominent scholars at Yale Law School, New York University School of Law, University of Virginia Law School, University of California-Berkeley School of Law, and Stanford Law School. Read the report’s executive summary here, and the full report here.